Horrors, it seems that the last time I posted anything on my blog I was focused on daffodils and tulips! How time flies for this lazy gardener. I vow to make it short and sweet from now on – so that I post more, instead of just thinking about it. This is my contribution to Cathy’s lovely meme at Rambling in the Garden. I picked more than two vases yesterday – four in all. The dahlias, zinnias and everything else are really getting up some steam now, in spite of the hot weather. Today the Ammi visagna that I put in to partner them is wilting. But then, everything is wilting at the moment. Fortunately the snapdragons, ‘White Giant’, ‘Crimson F1’ and ‘Appleblossom’ are heat-resistant, both in the house and in the garden. I can never thank Christina at Creating My Own Garden of the Hesperides enough for turning me on to them (although she doesn’t like them herself – what a twist!). Because everything is so scorched and miserable, I think I’m loving my second vase more. The larkspur ‘Giant Imperial Mixed’ look nothing special against the parched earth, but in a vase with the red and white snappers, they are truly lush. Go on over and see everyone else’s vases – and I hope you come back here soon for a little update on my long-coveted greenhouse … which has not let me down this year, unlike the sweet peas! This entry was posted in A vase on Monday, Ammi & other umbellifers, Zinnia and tagged Ammi visagna, Antirrhinum 'Appleblossom', Antirrhinum 'Crimson F1', Antirrhinum 'White Giant', Zinnia 'Benary's Giant Lime', Zinnia 'Purple Prince' on July 23, 2018 by Cathy. On Sunday I set my screensaver to flash through pictures of the 2015 garden and was rather inspired by how much I had managed to create in the weedy Hornbeam Gardens this year. Last year it was only a field, but this year it brought us quite a lot of joy (and vases … too many actually). I would have liked to recreate the same impact here, but can’t quite work out how to do it (I think you need Java something or other). 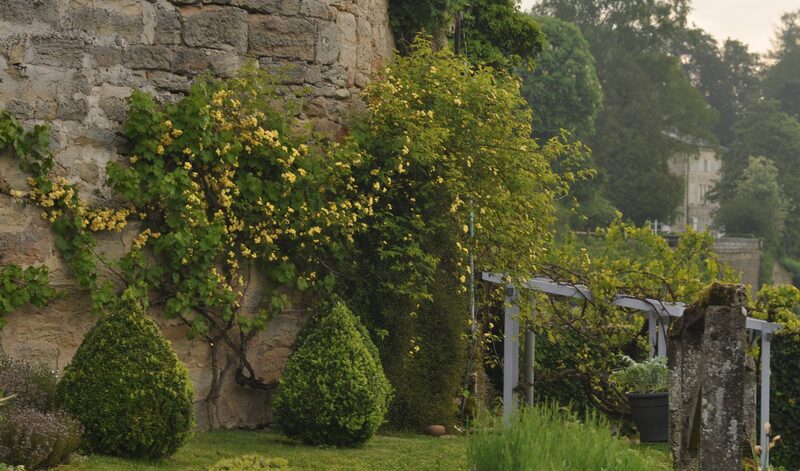 It was my husband, Nick, who suggested we should have a cutting garden at Châtillon. The hedges for the Hornbeam Gardens were planted in February 2013 and lightly clipped for the first time this autumn. They are only just beginning to make the two ‘rooms’ that I’m after. The top ‘room’ (nearest in the photo – bare soil) is the cutting garden. The bottom ‘room’ is much grassier in the photo and has the new shrubs I planted last year. The garden in April. It all looks very tidy, given it was a field the previous season. The supports are up for the sweet peas, the delphiniums are planted mid-border on the right of the path, with asters to the rear. In the lower part of the garden (dedicated to spring & summer-flowering shrubs), you can actually catch a glimpse of the hornbeams themselves, to the rear of the monster docks. I don’t think you can miss the docks (even if the hornbeams are hard to locate) … they are pretty much dwarfing everything else. I had just sprayed them with the evil, nameless one that I’ve always considered – until this year – to be one of the few chemicals I’m happy using. The idea with this whole area of the garden (and the orchard next to it) is that even our 79-year-old selves should be confident enough to venture down the 98 slippery steps by the time April comes in – so we can begin to go to town on blossom down here from that point in the season onwards. Just a little later, in May, the garden looks messier (not strimmed that week!) but the plants are growing on well. Signs of progress in the area where seed was sown. Next in the rows were Gladioli ‘Safari’ and ‘Buggy’. Both in greeny-yellary shades and small-flowered. Definitely for the flower arranger (that’s me) who prefers what Nick calls ‘jazz plants’: in other words flowers that are green and uninteresting to all but the aficionado. Then came Ammi majus and Ammi visagna. I was sorry that flat-headed A. majus failed to germinate, but the domes of A. visagna were a joyful revelation – lasting so long in water – and I’m never letting it go now. Am also dreaming of adding Euphorbia oblongata, which I recently read described as a kind of living florist’s foam. Sounds just grand to me. Then came Cosmos ‘Sensation Mixed’. Due to the fact that I fail to pinch/space properly, cosmos are always ugly things here. They grow to 2 metre monsters without proper control and I’m continually disappointed by them. No change this year … must do better. I have a yen to trial all available marigold seed strains in connection with a little sideline I’m planning, so I tried ‘Sherbet Fizz’ and ‘Touch of Red’, as well as ‘Greenheart Orange’ (all T&M). I liked ‘Sherbet Fizz’ a lot, but ‘Touch of Red’ was disappointingly similar. ‘Greenheart’ not as exciting as in my long-ago memories. Then came Cornflower ‘Tall Mixed’, Larkspur ‘Sublime Mixed’ and Cornflower ‘Black Ball’. All lovely, but suffering badly from neglectful gardener syndrome. Could have done with pinching and supporting – unfortunately I was too busy strimming, mowing and generally hacking … elsewhere. 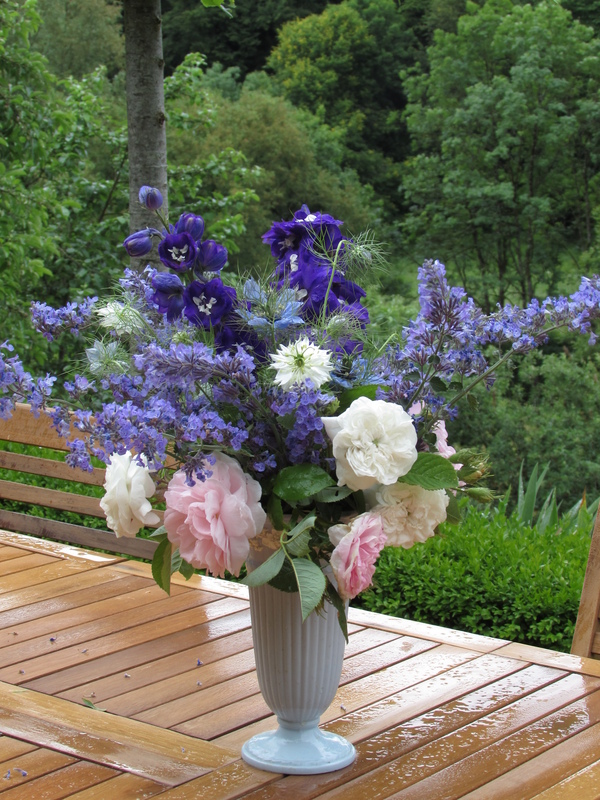 The larkspur served (with dahlias and others) as my contribution to a May event in Châtillon. They were, in all their breathtaking perfection, studiously ignored by the ‘real’ florists who concocted the bouquets. Florists like flowers that last a very long time – and they didn’t choose any of mine! The garden has been strimmed now, so you can see the hedges (and the heaps of rubbish!) more clearly. Can’t imagine how I’m going to get some decent grass paths without digging them up and sowing seed … but there’s still no time here for that kind of pernickety stuff. Later. In the picture above you can see quite a few tubers from 2014 seed-sown dahlia ‘Bishop’s Children’, whose dark foliage is just shooting through in front of the delphiniums. Putting them there was a BIG MISTAKE … we had to peer over their heads to see the delphiniums cowering behind. As I said, I am definitely an Ammi visagna convert – here with another triumph which I’m hoping to repeat, and repeat … double Zinnia ‘Green Envy’. Not all the flowers were double, but I liked even the 50% of singles for their colour. Dahlia ‘Nuit d’Été’ is looking a bit past it in the same vase, but Gladiolus ‘Safari’ looks fairly pert. Here you can see (to the right) the ‘Bishop’s Children’ foliage more clearly. And, just above, towards the camera, the green shoots of my best move to date … still reading? Into July and ‘Velvet Queen’ is doing her thing. And …. this is it! Agreed by both of us to be the success of the year. A mix of seed saved from the garden in 2014: calendula, cornflowers, Clary sage and nigella. The amazing thing was that they needed no support. The sticky stems of the marigolds held the others up – unlike the defeated cornflowers (re-enter ‘Black Ball’) in another area of the cut flower garden. And I cut them, and cut them. I’m sure you’ve already tried this at home – but I was gobsmacked by how something so simple worked so well. 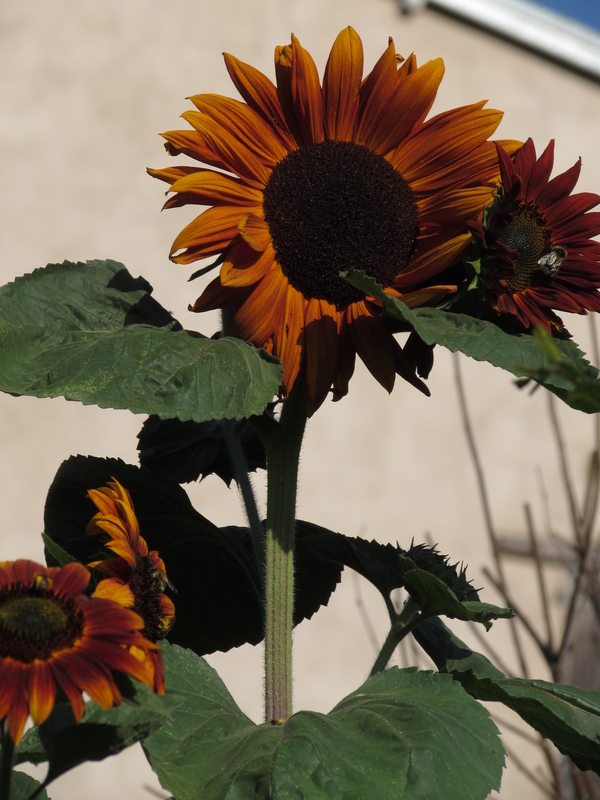 And carried on flowering (without water), throughout an exceptionally hot July & August. I just want to inject a little more of the salvia and nigella next time. The sweet peas (this is, I think, ‘Molly Rilestone’) were the best ever, in spite of the hot summer. It was the first year that I tried them off the hot terraces and in this cooler part of the garden (also the first year that I had a ‘cooler part of the garden’ to cultivate). From July, however, the growing tips began to be deformed/fasciated. After some research on the net I decided this was a cultural shock: difference in day/night temperatures, watering in the evening rather than – more correctly – in the morning. I understand cultural shock all too well, as a Scottish-Canadian transplanted to France. They grew out of it a little, but it did stop them in their tracks towards the end of July. And, of course, I didn’t get round to taking their photos until a little too late. ‘Chatsworth’ and (I think) ‘Molly Rilestone’ growing together. But the hazel supports were a real mistake. Too heavy and mighty for such delicate flowers. I’ve tried to find a (ready-made) substitute that looks good, so far with no success … suggestions? The ‘Bishop’s Children’ and those scrumptious cornflowers/marigolds again. I discovered (through a lot of cutting) that the Bishop’s Children don’t make such good cut flowers, but the foliage is superb. 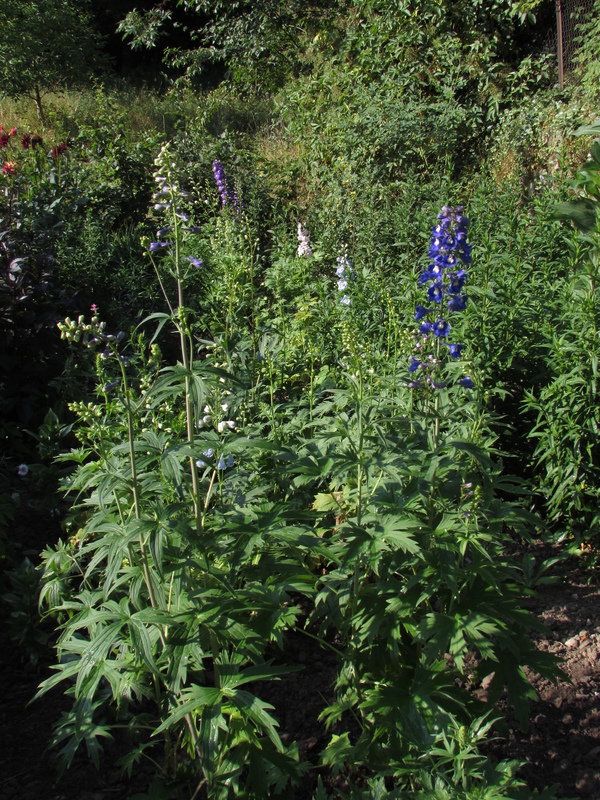 Nick’s delphiniums flourished (courtesy of a Hayloft Plant collection – or two – in 2014. Their arrival here is another postal horror story). This was fitting, since they were the first things I was sure should be planted down in the cut flower garden. They even survived a bit of a pummelling from a marauding bullock tempted over from the other side of the river in search of fresh grass. 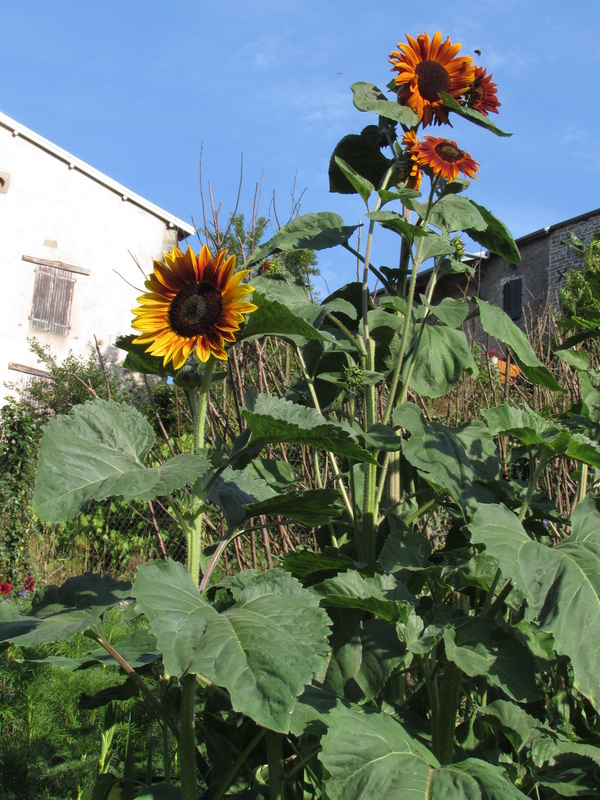 Now we are down in the same area putting up supports for espaliered apples and pears – I’m regretting letting the weeds outrun me, but mentally preparing my annual seed list and corm/tuber list for 2016 (I have ‘collecting fever’ for dahlias and gladioli). And I do wish that online nurseryman Jacques Briant had not sent me a special ’10€ off’ voucher for my birthday, just at the point when I am pondering planting the odd Hybrid Tea for long-stemmed roses in the future. How can you resist the lure of spending 60€ (that you haven’t got) in order to save money? What cut flower could you not be without? This entry was posted in Cut flower garden, Garden development, Hornbeam Gardens and tagged Ammi visagna, Calendula 'Greenheart Orange', Calendula 'Sherbet Fizz', Calendula 'Touch of Red', Centarea cyanus 'Black Ball', Centaurea cyanus, Dahlia 'Bishop's Children', Dahlia 'Nuit d'Été', Gladiolus 'Safari' & 'Buggy', Larkspur 'Sublime Mixed', Sunflower 'Velvet Queen', Zinnia 'Green Envy' on December 30, 2015 by Cathy.